Wild salmon is a wonderful source of omega-3 fatty acids, is an easy fish to prepare, and is very versatile too. Salmon is best prepared simply, and when cooked by slow roasting it comes out moist and delicious. In this recipe, I placed the salmon on a bed of tender crisp julienned fennel and red peppers, and then top it with sweet caramelized roasted tomatoes. All you would need to complete the meal would be a crisp mixed salad and some fresh fruit for dessert! Wild salmon is rich in omega-3 fatty acids which help lower triglycerides and blood pressure, carotenoids which have anti-inflammatory properties, as well as the mineral selenium, B vitamins, and vitamin D.
Fennel contains a combination of phytonutrients, including the flavonoids rutin,quercitin, and various kaempferol glycosides which give it strong antioxidant activity. Fennel is also a good source of vitamin C, folate, fiber and potassium. Slow roasting salmon keep in moist and tender. At least two hours before dinner, preheat the oven to 275 degrees F.
Cut the cherry tomatoes in half, and toss with 2 tablespoons of the olive oil. Place on a baking sheet and season with salt and pepper. Bake for about one and a half to two hours or until the tomatoes begin to brown and the skin shrivel but still remain moist. Remove from the oven and toss with the basil. Remove the fronds and stem from the fennel, core the peppers and remove the seeds and cut both into thin julienned strips about 1/4 of an inch thick. Heat two tablespoons of olive oil in a frying pan and cook the vegetables until tender crisp, about 5 to 7 minutes. Rub the salmon with the remaining two tablespoons of olive oil and season with salt and pepper. Over medium high heat in a large ovenproof saute pan, sear the skin side of the salmon fillets until crispy. Place the pan into the oven and bake for about 20 minutes or just until the salmon is just barely cooked through the center. 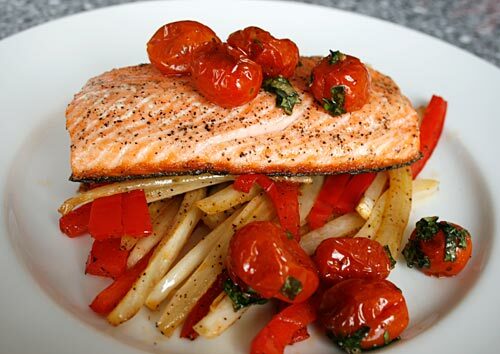 To serve, place some of the fennel pepper mix on a plate, place a cooked salmon fillet on top, and then spoon on some of the roasted tomatoes. I’m glad to read that cannellini beans work just as well as garbanzo beans, since I really don’t care for garbanzos. I thought maybe the cannellini’s might fall apart more easily, but since they’re listed in the recipe I’m going with that! Today is just the sort of day that makes me think about making white chili – and then your recipe arrived! Good timing! Barb, I was never fond of garbanzo beans myself which is why I started using cannellini beans instead. Though I have learned to appreciate garbanzo beans, I still use cannellini in this recipe. As long as you do not cook them too long, they hold together nicely in this recipe. The recipe lists 1/4 cup cornmeal. At the end where you say to “add 1/4 cup of the polenta to thicken”, is that where you add the cornmeal? and it’s just uncooked cornmeal, correct? Barb, yes, just add the uncooked cornmeal.